I had the idea for these little cuties a few weeks ago, but decided to wait to make them until I had a few girlfriends over. The recipe is simple and such a fun girls night idea if you’re looking for something to do to celebrate the season. Plus, everyone gets to go home with their own apple and you’re not stuck eating a whole batch, which is good. Any excuse for me to NOT eat them is a good one for me. You can use any apples your want for these guys, but usually I like to stick with Granny Smith apples because the tart-ness of the apples tends to cut down on all of the sweetness from the layers. Also, that pop of green looks really pretty against the orange candy melt and the ooey caramel too! And I’m warning you that these babies are G-O-O-D! It’s hard not to eat more than one. First, wash your apples and remove the stems. Insert your sticks into the center of your apples. (I used a kitchen mallet to help ease them in). Place your caramel bits into a medium saucepan. Add 2 tablespoons of water and heat over medium-low heat. Stir occasionaly until the caramel has completely melted. While you are waiting for your caramel to melt, line a baking sheet with parchment paper and spray with cooking spray. This will prevent your gooey apples from sticking! Once your caramel bits are melted, remove from heat. I find that the easiest way to dip my apples is to do it in the original saucepan. that I used to heat the caramel. (It also means less dishes to wash!) Tilt the pot up and onto an angle so that the caramel sits into the bottom corner of your saucepan. 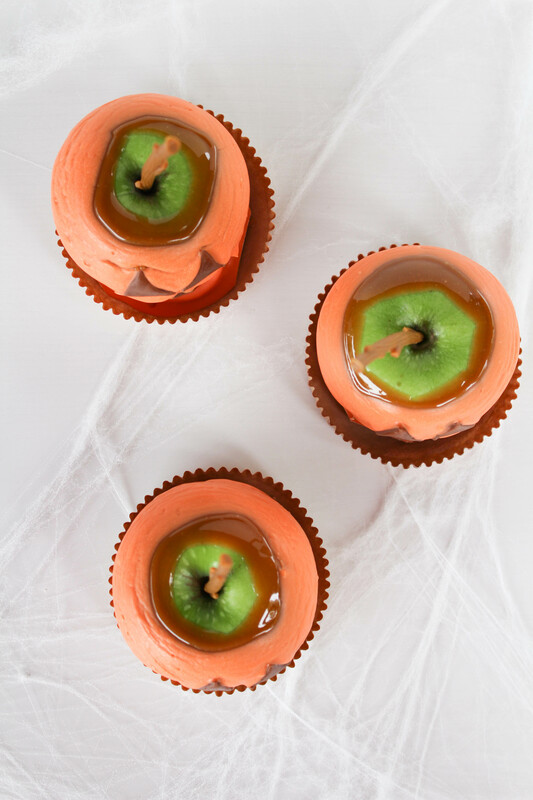 Roll your apples in the melted caramel, ensuring to cover all sides. I also leave a bit of my apple showing on the top, so don’t dip too far to cover the entire apple, unless that’s what you’re going for! Once your apple is completely dipped, shake off the excess caramel but tapping the apple over your hand. Once most of the excess has fallen off, place onto the parchement paper. Repeat with all 5 apples. 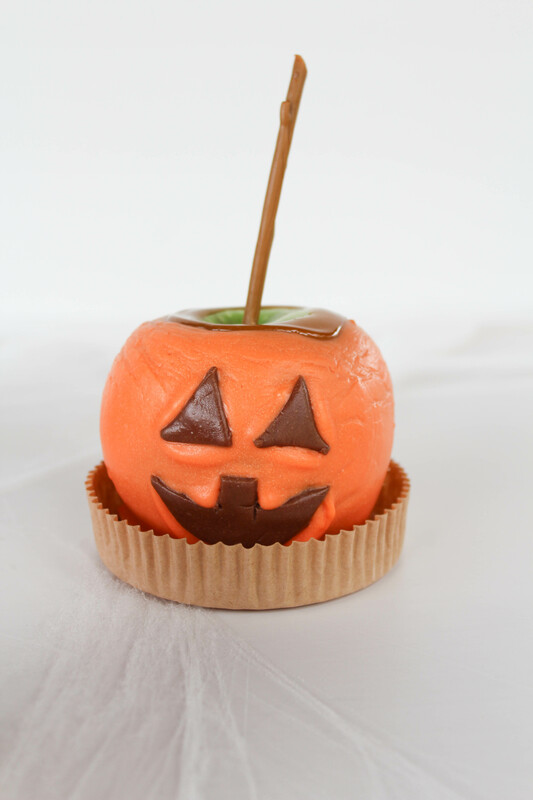 While your caramel covered apples are cool, begin making the faces for your jack o’lantern apples. Unwrap a few toosie rolls and place into a microwave safe container. Heat on high for 15 seconds, or until tootsie rolls are softened. Remove from container and place on a cutting board. Mush all of the tootsie roll pieces together to form a ball. Using a rolling pin, roll the toosie roll ball out into a thin sheet. Cut out the eyes and mouth for your face using a shark kitchen knife. If you don’t have enough for each of your apples, repeat the toosie roll process until all face pieces are cut out. Place the finished pieces aside. Next, pour your candy melts into a microwave safe container. Heat on high for one minute. Remove and stir. Place back into the microwave for another 30 seconds. Remove and stir. If your chocolate is completely melted, you’re ready to dip again. If not, place back into the microwave for another 10-15 seconds until completely melted. 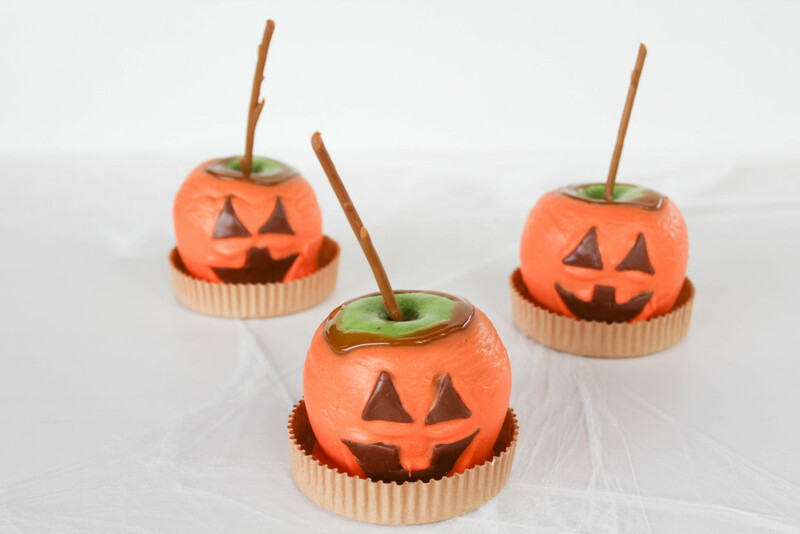 Once your chocolate is melted, begin dipping each of the caramel covered apples using the same technique as the caramel dipping. Tap off the excess chocolate and place onto your parchment sheet. While the chocolate is still warm, place your tootsie roll “face” pieces into the orange chocolate and hold for a few seconds to ensure the toosie roll pieces stay in place. Repeat for all 5 apples. Allow to cool completely and then eat! 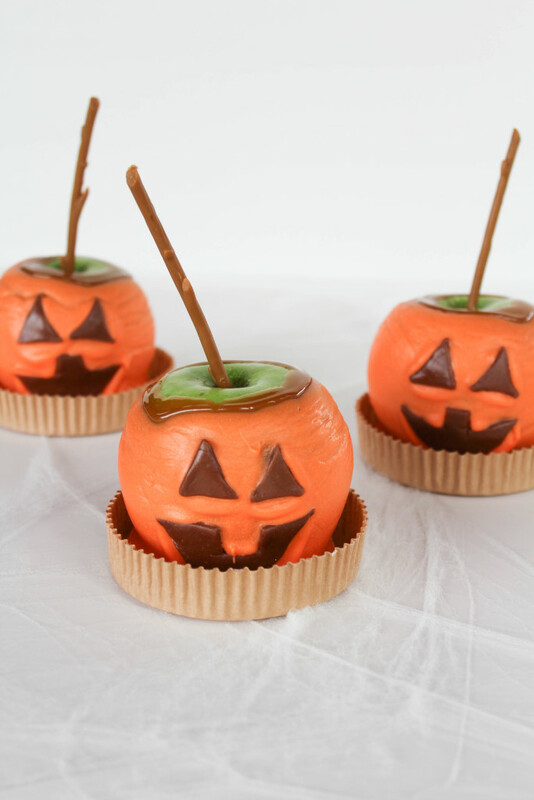 These Jack O’ Lantern caramel apples are really easy to make and are so yummy! They make the perfect boo gift for a neighbor, co-worker, friend or family member too!